SemiGen offers wafer processing on alumina, aluminum nitride substrates up to 4.25 in. 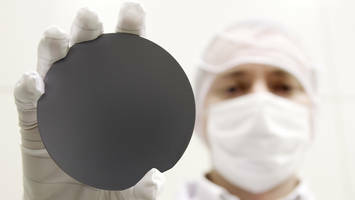 and 100 to 150 mm silicon wafers. The wafer processing services consist of combination of photolithography, wet etch, dry etch, metallization, grinding, polishing and in-process metrology. SemiGen also performs screening of amplifiers, FETs, MMICs, transistors and diodes. SemiGen provides test results with full documents according to MIL-PRF-19500, MIL-PRF-38534, and MIL-PRF-38535 requirements. Manchester, NH – June 12, 2018 – SemiGen, Inc., an ISO and ITAR registered RF/Microwave assembly, automated PCB manufacturing, and RF Supply Center, is pleased to announce that after moving into their new state-of-the art facility, they’ve increased their foundry and screening capabilities significantly. SemiGen is now offering wafer processing of 100 to 150 mm silicon wafers, as well as alumina and aluminum nitride substrates up to 4.25 inches. Services provided include any combination of photolithography, wet etch, dry etch, metallization, grinding, polishing, as well as in-process metrology. Recent investments in RF Test and Hi-Reliability environmental test capabilities has also enabled SemiGen to offer solutions for High-Reliability (Hi-rel) screening of amplifiers, FETs, MMICs, transistors, diodes, and other active and passive circuits and components. Tests are performed and are delivered with full documentation in accordance with MIL-PRF-19500, MIL-PRF-38534, and MIL-PRF-38535 requirements. Element evaluation and screening options from Class H, Class K, TX, TXV, S-level, as well as custom SCD driven requirements are available. SemiGen is a leading RF/microwave solutions company that provides manufacturing services and products to fill the voids in the supply chain and manufacturing floor. SemiGen’s design and manufacturing center includes RF/microwave assembly, PCB, box build, module repair and test services coupled with the semiconductor devices and manufacturing supplies needed for successful products in the RF/Microwave hybrids and components. Their team helps with designs, builds prototypes, and handles volume production runs for the RF/microwave, military, space, homeland security, optical, medical device, and commercial wireless markets. Their 17,000 square foot facility includes a class 10,000 clean room and offers manual to full automatic assembly for any manufacturing challenge. The company was founded in 2009 and is based in Manchester, NH.